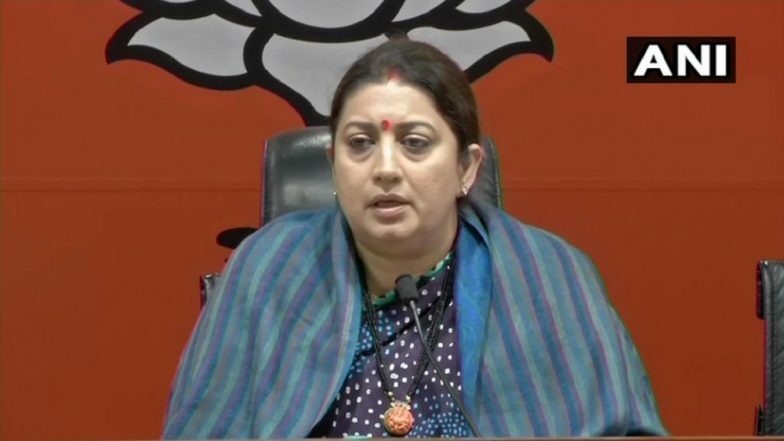 Amethi, April 11: Union minister and BJP candidate from Amethi Lok Sabha seat Smriti Irani Thursday submitted to the Election Commission that she did not complete her graduation from Delhi University. In her affidavit filed during her nomination, Irani, who is contesting against Congress chief Rahul Gandhi, said she passed secondary school examination in 1991 and senior secondary school examination in 1993. She has said she did not complete her Bachelor of Commerce (Part-I) — a three-year degree course — from Delhi University's School of Open Learning in 1994. In her affidavit for 2014 polls, she had reportedly said she graduated from the university in 1994, triggering a row over the veracity of her claim, with opposition parties alleging she was not a graduate. Smriti Irani Files Nomination From Amethi Lok Sabha Seat Against Rahul Gandhi. This year, she has declared assets worth over Rs 4.71 crore. According to the affidavit, Irani has declared movable property worth over Rs 1.75 crore. Her immovable assets are worth Rs 2.96 crore, which include an agricultural land valued at over Rs 1.45 crore and a residential building of Rs 1.50 crore. In the movable category, she had cash in hand till March 31 totalling about Rs 6.24 lakh besides over Rs 89 lakh in bank accounts. She also has over Rs 18 lakh in NSS and postal savings insurance and another Rs 1.05 lakh in other investments. Irani has vehicles valued at Rs 13.14 lakh and jewellery worth Rs 21 lakh. There is no FIR pending against her and she has not taken any loan. Her husband Zubin has movable property of more than Rs 1.69 crore and immovable property worth Rs 2.97 crore.